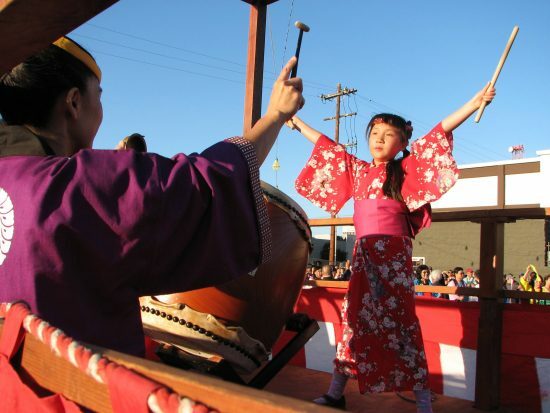 Los Angeles Hompa Hongwanji Buddhist Temple (Nishi Hongwanji), 815 E. First St. in Los Angeles, will hold its annual Obon Festival on Saturday, July 9, from 1 to 10 p.m. and Sunday, July 10, from 1 to 8 p.m. The festival will feature a farmer’s market, sushi, manju, chili rice, hot dogs, somen, boba, udon, beef and chicken teriyaki plates, dango, chashu bao, snow cones, drinks, games, a plant sale, and much more. Tea ceremony demonstrations will be given both days from 2 to 4 p.m. A cultural display will be on view from 1 to 9 p.m. on Saturday and 1 to 8 p.m. on Sunday. Buddhism Q&A sessions will be held in the Hondo on both days from 3:30 to 4 p.m. and 4:30 to 5 p.m.
Bingo will be played in the Kaikan from 4 to 10 p.m. on Saturday and 3 to 8 p.m. on Sunday. Bon Odori will be held in the West Lot on Saturday from 7 to 9 p.m. and Sunday from 6 to 7:55 p.m. The festivities will conclude with a raffle drawing on Sunday at 8 p.m. Tickets are $5 each. Winners need not be present. Prizes: $2,000, $1,000, $500 and $250 cash; a package of four Disneyland Park Hopper tickets valued at $620; an Apple iPad; four Dodger tickets plus parking; and dinner at Maison Akira. Obon services will be held on Sunday, July 17, at Evergreen Cemetery (9 a.m.), in the Hondo (10 a.m.) and in the Nokotsudo (11:30 a.m.). For more information, visit www.nishihongwanji-la.org.